First of all, which is it? Derry or Londonderry? Well, if you are a nationalist (typically the Catholic community) it is Derry and if you are a unionist (typically the Protestant community, wanting to keep the ties to the UK) it is Londonderry. 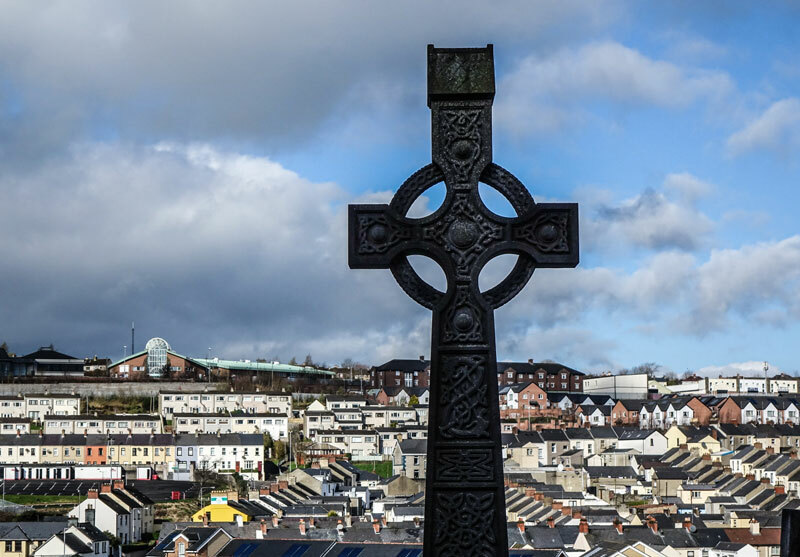 Although the official name is Londonderry, it was originally called just Derry, from an old Irish word meaning oak tree, which is the symbol for the city, but was changed when a group of settlers from England and Scotland arrived in the early 17th century. So what you call the place broadly reflects the split between Catholics and Protestants, although strangely enough I know of at least one strong Unionist group called the Apprentice Boys of Derry, which only goes to prove what we know already: Irish politics is exceptionally complex and difficult to get your head around. 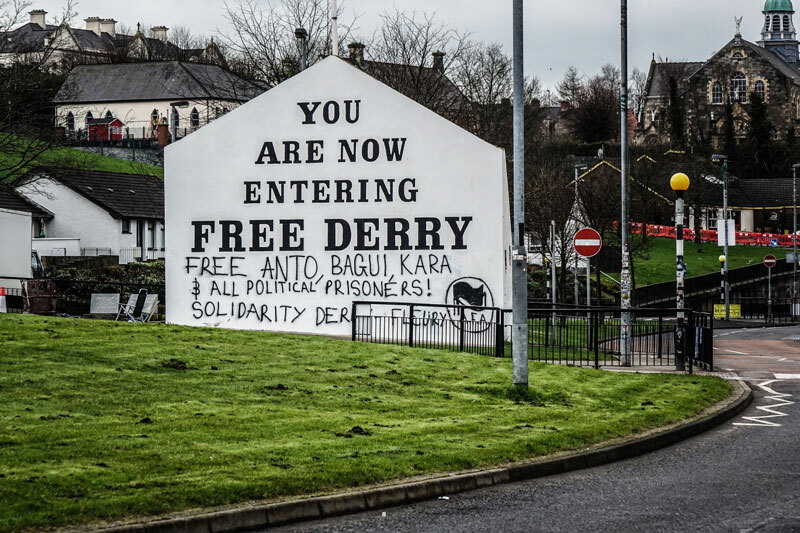 In deference to its origins, as opposed to its colonial history, we’ll stick with Derry. 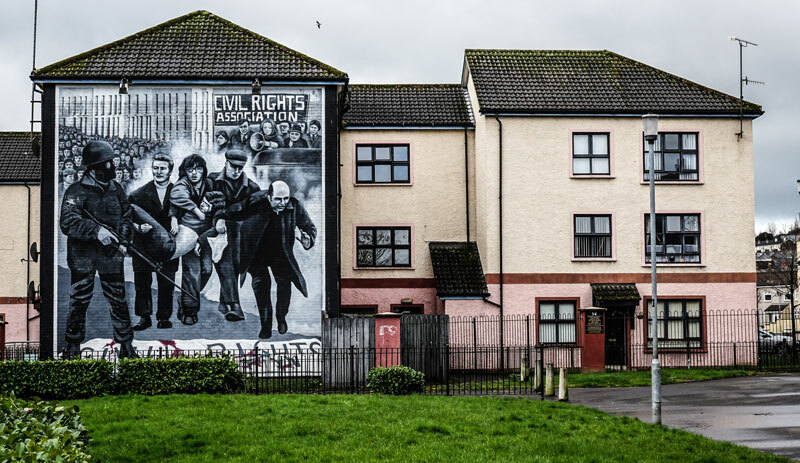 Mostly painted between 1997 and 2001, the murals commemorate key events in the Troubles, including the Battle of the Bogside, Bloody Sunday, Operation Motorman and the 1981 hunger strike. 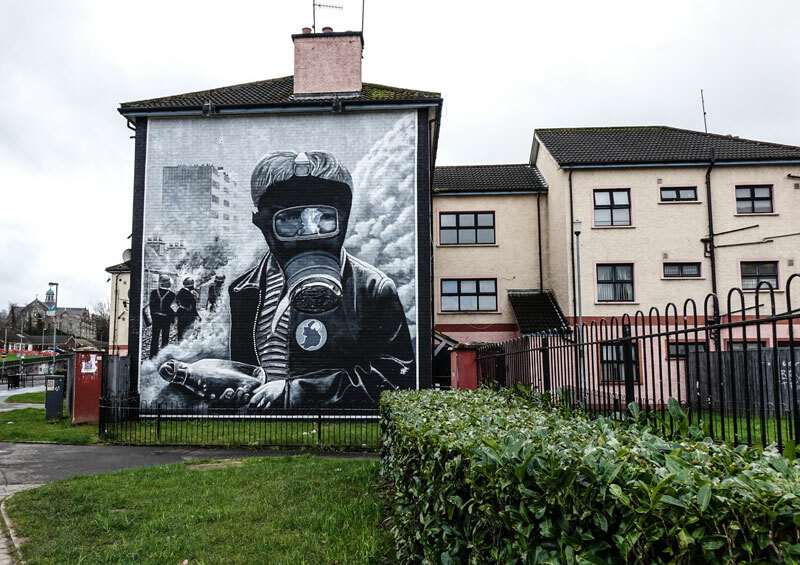 The most powerful images are those painted largely in monochrome, consciously evoking journalistic imagery – Operation Motorman, showing a British soldier breaking down a door with a sledgehammer; Bloody Sunday, with a group of men led by local priest Father Daly carrying the body of Jackie Duddy (the first fatality on that day); and The Petrol Bomber, a young boy wearing a gas mask and holding a petrol bomb. The most moving image is The Death of Innocence, which shows the radiant figure of 14-year-old schoolgirl Annette McGavigan, killed in crossfire between the IRA and the British Army on 6 September 1971, the 100th victim of the Troubles. Representing all the children who died in the conflict, she stands against the brooding chaos of a bombed-out building, the roof beams forming a crucifix in the top right-hand corner. At the left, a downward-pointing rifle, broken in the middle, stands for the failure of violence, while the butterfly symbolises resurrection and the hope embodied in the peace process. 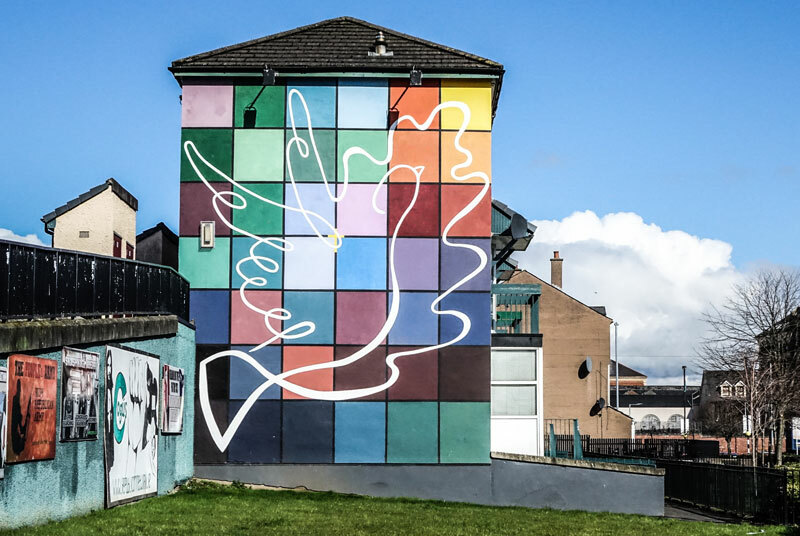 The final mural in the sequence, completed in 2004, is the Peace Mural, a swirling image of a dove (symbol of peace and of Derry’s patron saint, Columba) rising out of the blood and sadness of the past towards the sunny yellow hope of a peaceful future. What gave these murals extra impact and poignancy for us was that, as Paddy and Catriona took us around, we learnt that Paddy was brought up in this very area, known as the Bogside. His sister knew Annette McGavigan, and Paddy went to school with one of the three artists who painted the murals. It is such direct connections that make the tragedies of those quite recent times very real and immediate and quite shocking. 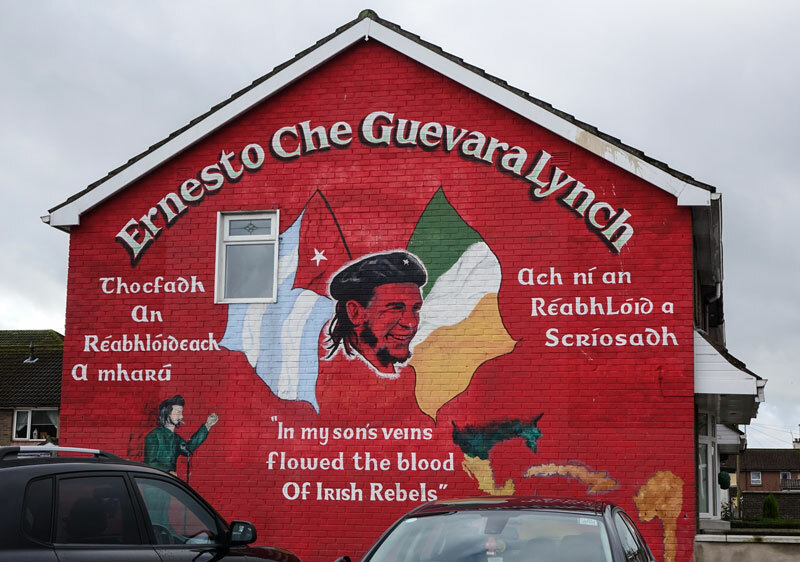 To finish on a lighter note, who knew that Che Guevara’s grandmother was an Irishwoman called Anna Lynch from Galway who emigrated to South America? The quote below is attributed to her son Ernesto, Che’s father. Very powerful images. Being relatively recently somehow brings it home even more. You have documented it well and made it another very interesting blog. All your blogs and photos would make a great book. It makes , as you say, the uprising in Ireland more real than just reading about it in the news. WHAT an amazing time you and Phil have had in the last 3 years, and how lovely it has been to get your famous photos and blogs. Pretty boring back in Hamilton methiks !! When do you actually hit terra firma of Aotearoa and do you need a lift back home? I could do the decent in my new Kia sportage if you like ! !